Well here’s a little thing I’ve been meaning to do for a while. Here’s a little playlist of what this Horse has been listening to over the past month. This’ll become something of a regular feature, probably monthly, perhaps more often. It won’t neccesarily be all brand new stuff, but hey, this month, it pretty much is! Enjoy! So this month we have the likes of Kendrick Lamar (the rapper with a whole lot of hype right now, and for good reason). Also featuring is a little bit of Divine Fits (side project of Brit Daniels from Spoon), one of the new Little Comets album tracks, and some gnarly old Gnarwolves. So this month we have the likes of Kendrick Lamar (the rapper getting the most hype right now, and for good reason). Also featuring is a little bit of Divine Fits (side project of Brit Daniels from Spoon), one of the new Little Comets album tracks, and some gnarly old Gnarwolves. Is there such a thing as Robot Rock? Some would argue that Daft Punk gave it a go. I mean, they actually had a song called Robot Rock. Plus they dress up like robots, and made a soundtrack to Tron, a pretty damn robotty film. Well, sci-fi at least. There’s a point here somewhere, buried under the rusty metal of this clunky metaphor. 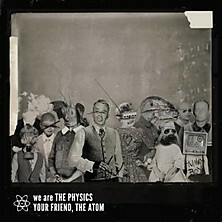 Sci-fi / robot rockers We Are The Physics have unleashed a jerky, thundering, end-of-level-baddy of an album, ‘Your Friend, The Atom’. It’s both a barrage of fun and a mindblowingly exhausting listen. It’s the second album from a band who aren’t afraid of poking fun at themselves, and others. With songs focusing on topics such as legendary tennis player Goran Ivanisevic, junkies eating buns and 1960s space exploration, they explain that they’d never choose to write a love song, as there’s 60 years of them already if you want to sift through. The ode to the 6ft+ Croatian madman is one of the standout moments on the record, showcasing what We Are The Physics do best, with a high-pitched looping 8-bit synth being overtaken by thundering riffs, gang vocals and a homage paid to his unflagging belief (he tried/he failed/he failed/he tried). Let’s face it, a song about Tim Henman would probably make you want to pull out your eye balls and serve them with a tennis racket. But this is just plain fun. The lyrics are one of the strongpoints throughout. On ‘All My Friends Are JPEGS’ lead singer Michael M neatly dissects the ridiculousness of social media, with an anti-anthemic chorus line of “I don’t like you much/so let’s keep in touch.” Buried amongst the barrage of noise surrounding it is the occasional sneaky melody that matches up and hacksaws its way into your brain. The main challenge is filtering through everything else that is happening. ‘Napoleon Loves Josephine’ is a more of a cruisey jam, but still hops and jives around energetically. It’s a moment that is reminiscent of the nervy angular rock of The Young Knives. The album is 14 tracks long and rarely slows down from a lactic-acid inducing sprint. It’s a challenge to properly digest it all in one sitting, and while a more condensed and lean record may have made it easier to love, there’s enough here to enjoy.